First of all, I'd like to say that my wife beat me to this. . .I had this whole plan about telling you all about The Shambles' first castle (it came complete with a moat and four towers and EVERYTHING) but she's already posted about the castle we slept in so it would be a little out of order for me to be talking about our first castle now. . .But, that's not going to stop me from adding a photo of it. . . But ANYWAY, that's not actually why I was writing this post. . .
On Tuesday I took Shelley to London so we could activate our English Bank Account and maybe take in some sights. . .The Bank we had to go to was on Oxford Street, which as you may or may not know, is full of shops. Think multiple shops with three floors of woman's clothing each. . .HUGE stores and apparently, all having sales. For those of you that know Shelley, I think it will be no surprise to you that we didn't see any sights. In fact, we didn't get off Oxford Street. We did make it to one "sight", before we got to Oxford Street I managed to get Shelley to Buckingham Palace. Unfortunately however we were there during the changing of the guards and the crowds were HORRENDOUS!! So we didn't actually get to see much of the Palace. Not too disappointed though as both Shelley and I are more interested in the Theatres anyway. So, sometime next week we shall be heading back to "The Big Smoke" and going from The Globe to West End and, hopefully, taking in some shows. Wicked, Chicago, Phantom, Sound of Music. . .we shall take our pick!! I just wanted to leave a comment, so that you would know that someone is reading your blog. I am. I like the pics. Keep them coming! OHHHHHHHHHHHHHHHH, sounds exciting. Pleased your adventure is going well. 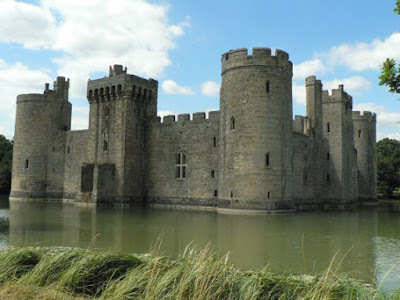 Was there any swimming dragons in the moat? Neeny is reading them also!